Back in the 1800s, Victor Hugo had no idea he was writing a novel perfectly suited to Lon Chaney's persona, but it is hard to believe otherwise. The versatile actor built a screen career out of making sacrifices for, and losing, beautiful young women: Leatrice Joy in The Ace of Hearts (1921), Norma Shearer in He Who Gets Slapped (1924), Joan Crawford in The Unknown (1927). A man who would blow himself up, get mauled by a lion or cut off his arms for love couldn't be better suited to play the hapless, loyal hunchback Quasimodo. In a beautiful new Blu-ray from Flicker Alley, it is possible to absorb every nuance of Chaney's brilliant performance. I remember seeing a copy of this film on VHS several years ago and barely being able to last through the running time. It was so frustrating to watch a Chaney film and not be able to clearly see his face. It was like watching a musical with the sound down. This edition offers greatly improved clarity; it was fantastic to be able to catch all of Quasimodo's little tongue flicks and reactions. Though covered in make-up, Chaney's expressions are finely-tuned and his hunchback much more sympathetic when you can appreciate the full content of his performance. That make-up took hours to apply, and Chaney did it himself. The film's cinematographer Virgil Miller recalled that the actor would arrive at the studio as early as 3:30 in the morning and would not be ready to shoot until 8:30 or 9. Stories like these, and marketing featuring the star, can make it easy to forget how much else happens in this huge production. While Chaney's performance does dominate, he actually disappears for long stretches. He's crucial to the plot, but the romance and peril of a gypsy girl to whom he is devoted drives the action. 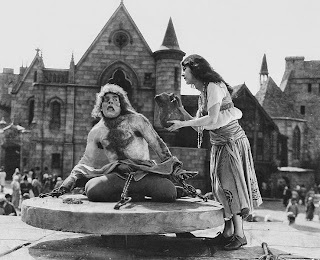 Quasimodo's absences have the effect of causing renewed shock each time he reappears. Your guts grind again as he lunges across the screen: tortured posture, face bulging with disgust over the treatment his ugliness inspires. 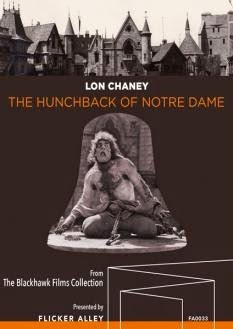 The special features on the disc are appropriately Chaney-focused and include footage from his first appearance on camera without make-up and a clip from Alas & Alack (1913), in which the actor also played a hunchback. An HD gallery of the sets is so sharp and clear that it's hard to believe the photos are over 90 years old. I can think of no better choice than Chaney scholar, biographer and professional make-up artist Michael Blake for the audio commentary. An essay by Blake is also included. It's a nice package, but if I just had that gorgeous print I'd be satisfied, because it has been such a long time coming. Many thanks to Flicker Alley for providing a copy of the Blu-ray for review.